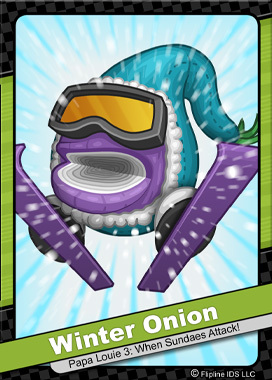 Winter Onions are spies for Sarge’s Infamous Onion Ring. They are usually sent on missions to areas with large amounts snow and frosting. Their hardiness to harsh climates make them a perfect fit for frigid locations. Winter Onions are experts skiers, and can quickly zip down slopes to scope out the lay of the land. They train at Sarge’s ski lodge hidden high atop the mountains beyond Mintley Meadows.